High Haven Cabin is a little slice of heaven. Amazing sunsets provide the perfect backdrop to a friendly billiards game. There is plenty of room for large families or groups to relax. Grill on the deck and take in fresh breezes on the screened porch. You’ll be glad you discovered High Haven Cabin. 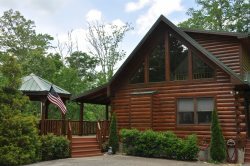 This multi-level log cabin has everything you want for the perfect mountain getaway. Three levels connected by beautiful spiral staircases, wood throughout, gas logs, a pool table, a hot tub, and much more make this the place to be. The loft master bedroom has a Queen sized bed, a private bathroom, and a balcony with a bistro table. The main floor bedroom has a Full sized bed. The downstairs bedroom has a Queen sized bed, private deck access, a TV and a Full sized futon. The game room with the pool table also has a full futon for additional guests. Full bathroom with Walk-in Shower. There are stainless steel appliances throughout the fully stocked kitchen. The beautiful dining table has room for the whole party – everyone can share in the dinnertime fun. The spectacular views will bring you back to High Haven Cabin year after year, season after season. This cabin is great! It was clean and had everything we needed. We were looking forward to the view and it definitely exceeded our expectations. We were also very pleased that the only other cabin that was close was behind us when looking out at the mountains from the back deck. Wonderful home. Will definitely Be back in the future! Beautiful home with an incredible view. The space was sparkling clean and the hot tub stayed perfectly hot the entire trip. Grill also worked amazing, will definitely be back! Thanks! Everything was perfect! We went to local restaurants, hiking and just relaxing. We loved the view from the cabin! Awesome view. Cabin perfect for 3 couples. Great value for the place. Hot tub exceptional. Sparkling clean. The cabin is nice and cozy. It has an amazing view and Was very clean. Very stocked kitchen. It had everything I needed to cook. We went snowboarding and hiking. We loved the view, the hot tub and the pool table! We loved the views, the decor of the cabin and the games and pool table! Our favorite memory from our stay was reading and watching the views from the loft. The cabin is the most beautiful we have stayed at. It is beautifully decorated and has everything you would need and more. We had a great time playing games, using the Hot Tub and cooking in the lovely kitchen. We love this cabin and will be back! This cabin was the most beautiful place we ever stayed. We loved the beauty of view from cabin. We enjoyed Fishing Hiking, Horseback riding and the train. We had an amazing time at the cabin. Thanks for a lovely trip. Made awesome family memories! Outstanding views!! The team was very helpful. We had a wonderful time at High Haven Cabin! The view was amazing and the cabin was beautiful! We enjoyed the deck and the great hot tub! The firepit was fun too! We had a wonderful time! We celebrated two wedding anniversaries while here. 35 for my parents and 4 years for me and my husband. God is good. Love the cabin, the views, the Hot Tub, games and nature. The view from the cabin was breathtaking! Words don't describe it! We got in the hot tub at night and the stars seemed so close. We also really enjoyed the pool table after we came in at night. Everyone was very friendly and helpful. We had 4 adults and two young children. The cabin was spacious enough to accommodate everyone easily. The view was the best Ive ever seen and we couldnt get enough of sitting in the rockers just taking it all in. The cabin was very nice and was very clean. We loved the view and enjoyed celebrating our 15th anniversary! The members of your team and very friendly and helpful. They are knowledgeable about the properties, booking and answered all of our questions. The views from this property exceeded our expectations.....We had a week of peacefulness, beautiful views of the mountains and wildlife everywhere. The cabin has wonderful amenities and it's so comfortable. One of the best features is the size of the property and the privacy. We especially enjoyed sunsets from the deck in the hot tub! Thank you for a wonderful place to celebrate our 40th wedding anniversary. We feel truly blessed to have such an awesome view of Gods Creation. The mountain vistas are beautiful and the wild life enchanting! The solitude, peace and tranquility are some of the wonderful things we miss about being in the mountains. This is our second vacation with you and we will surely be back! The view at this beautiful cabin is breathtaking. The cabin was very clean. We enjoyed our visit. It was better than the pictures!! The view is outstanding. The house has so much charm, it is so cozy! Such a perfect getaway! Absolutely amazing. We already decided we are going to rent this house again and again. It had such charm and was so cozy. The hot tub was awesome!